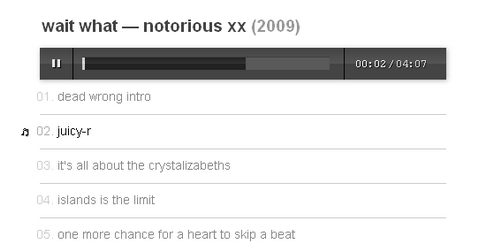 Audio.js focuses on playing mp3s. It doesn’t currently support the ogg format. As mp3 is the current defacto music transfer format, ogg support is lower on our list of priorities. It has been tested on Mobile Safari (iOS 3+), Android (2.2+, w/Flash), Safari (4+), Chrome (7+), Firefox (3+, w/ Flash), Opera (10+, w/ Flash), IE (6, 7, 8, w/ Flash).